When picking a toddler travel bed, there are lots of different options. The three main types are inflatable, roll out and collapsible. If space and flexibility is important to you, then you will want to pick an inflatable toddler bed. Why choose an inflatable toddler bed? Inflatable toddler beds are perfect when traveling or when wanting a spare bed at home that does not take up much space. Inflatable toddler beds are the most compact option when it comes to looking for a portable toddler bed. When not in use, inflatable toddler beds are ultra small. Once deflated you can fold them and squish them into small spaces. Perfect for when you need it to fit it inside of a suitcase or in the trunk of your car. They can also be quite flexible. Ones such as the Aerobed Mattress fit kids up to 150 pounds meaning your child will be able to use this bed indefinitely. The downside, of course, is that they need to be inflated and deflated. However, this is surprisingly quick and easy so should not cause an issue for most people. The main thing to look for in an inflatable toddler bed is what size child it holds. Be sure that the dimensions will fit your child and won’t be too short. You also need to check what weight that bed can hold and that your child fits within that weight. The next thing to look at is what size the toddler bed is when deflated and folded and ensure it is a size which is suitable for you. Finally, you obviously need to ensure the price is within your budget. Inflatable toddler beds are generally very good value. 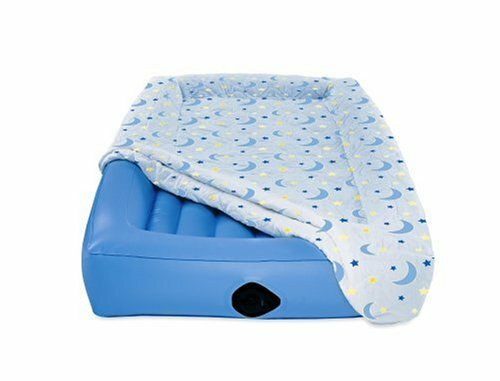 What are the best inflatable toddler travel beds 2017? 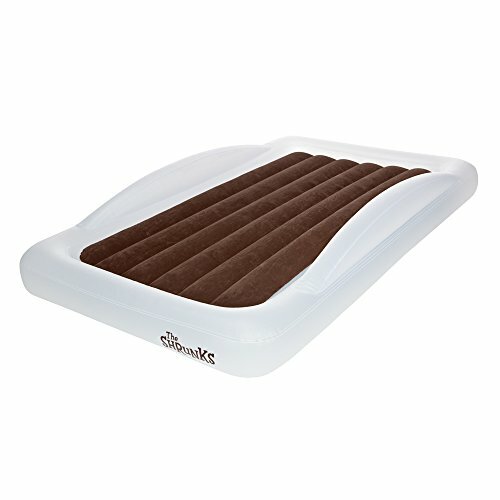 My personal favourite for a toddler or preschooler is the Shrunks Toddler Inflatable Travel Bed. It comes with an electric pump meaning it is ultra easy to inflate this bed. It also has higher sides to stop your child from rolling out. The Shrunks also features a unique Sheet Tuck system which enables you to tuck in sheets and blankets. All these features make this bed ideal for younger ones. Read our full review. If portability and longevity is of importance to you, then the Aerobed Mattress for Kids could be the best choice. This fabulous inflatable bed is great for bigger kids as it fits children up to 150 pounds. It also deflates to be quite small and lightweight. Coming in at only one pound, it is much lighter then the Shrunks when deflated. However, it doesn’t features the extra features of the Shrunk such as the Sheet Tuck and the high rests on the sides. Read our full review. Want to learn about other toddler bed options? Check out our full guide. Should you Buy a Travel Crib or a Toddler Travel Bed?